Use this on every ride! Not the greatest but very good. Does the job but I find it works best when applied to both the skin and the chamois, I still find myself getting irritated when I only apply this to my skin. Goes on well, works for 3 hours and is easy to clean up. What is not to like? My go to chamois creme for years now. It goes on grease free, doesn't stink, and keeps your bum saddle sore free. Yes, it's more expensive than most, but buy it on sale at BTD and you won't regret it. Good product, good price on sale from this vendor. Your behind will thank you for it. 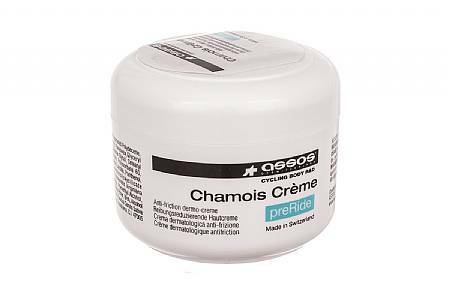 I never used a Chamois Creme until a few years ago. Now I dont ride without using it. Makes a long day in the saddle much more tolerable. Probably the best chammy cream out there, though not the cheapest! I have more problems than most with the effects of being in the saddle, in part because I put in 16-28 hour weeks on the bike consistently. I have tried most of the major brands and while I hate paying for it, assos is probably my favorite. I should also say that I had been using Hammer, which I liked but it is just a bit too thick and gritty and I reached a day where I could no longer tolerate the smell. I am also currently auditioning Betwixt which has a lot of potential and I may switch to it from Assos. Assos has an almost mousse-like texture, not liquidy like Chamois Buttr. This seems like a relatively ideal consistency for staying on, though I do still re-apply once on a 3 hour ride. It also has no smell and washes out of clothes really well. On the minus side, I can't totally tell, but it might have a little menthol in it, which is not something I love. There are at least three things that cycling enthusiasts should buy regardless of price. The first is a helmet. Helmets save lives. I got hit by an SUV and my helmet protected my head. Don't go cheap on a helmet. The second is the brightest rear light. Many cycling accidents happen when a car hits a cyclist from behind. Don't go cheap on a light. The brighter, the better. The third is cream. Saddle sores hurt. Don't go cheap on cream. Assos is not cheap but I have ridden 3,400 miles in two months and did not get saddle sores. Assos chamois creme works for me. I only use a small amount , so the container lasts quite awhile. It is nice and thick, and I haven't had saddle sores in years. If you've ever had saddle sores, you know they're something worth avoiding. I smear a little on the chamois and then put a dab on potential problem areas and it keeps me saddle sore free. It doesn't have petroleum jelly or anything greasy that clogs up your chamois so your shorts come out of the wash clean every time. Expensive but worth it. I buy a handful of jars at the beginning of the season so I've always got them. Great for keeping chafing at bay. Seems to have a healing effect on minor rashes. Thick enough to stay where you put it. Lasts longer than others and less scentodor than others. When on sale can be cheaper too. Wish it were also packaged in a tube for travel.